If we go by the results of this latest meta-analysis, athletes and experienced gymrats don't benefit from HMB supplements. 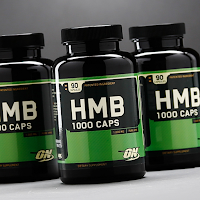 Roughly 4 years ago, HMB, which, once hailed as "as potent as a weak androgenic steroid", had been forgotten by most fitness enthusiasts, when - all of a sudden - a single study by Wilson et al. put it back into the limelight. In fact, there's hardly a study that has been so heavily debated in the fitness geek community as Wilson's infamous HMB paper with the steroid-like gains from March 2014 (Wilson 2014). Since Wilson's paper has (as of now) not been retracted, it does seem odd that a group of scientists from Chile and Spain write in the conclusion of a new meta-analysis that's about to be published in the Journal of Science and Medicine in Sport (Sanchez-Martinez 2017) that they found "no effect of HMB supplementation on strength and body composition in trained and competitive athletes" (Sanchez-Marrinez 2017)... unless, obviously, the study was not included. But let's address one thing after the other. HMB + Whey = Useless?! HMB Lower Body Fat, Higher T? Furthermore, all studies had to be randomized controlled or crossover trials. They had to use standardized or controlled diet, and strength or sports training, to include measurements of body mass, fat-free mass, fat mass, bench or leg press strength, and to include sufficient information for calculating the effect sizes (ES). pooled standard deviation for two independent samples) and 95% CIs were calculated for each study by means of t-scores, number of participants, and SD (When the SD was unavailable, it was calculated from the square root of the sample size multiplied by the standard error of the mean). ES was interpreted as follows: <0.2, trivial; 0.2–0.6, small; 0.6–1.2, moderate; >1.2, large. Figure 1 (left): PRISMA 2008 (see Liberati 2009) flow diagram of the process of study selection| Table 1 (right): Main characteristics of selected studies based on PICOS recommendations (Martinez-Sanchez 2017). Next to the primary and secondary outcomes (strength and body composition changes), the authors also conducted a stratified exploratory analysis comparing (i) HMB doses (3g/d, 3g/d time-release and 6g/d); (ii) duration of intervention (<4week or ≥4week); (iii) training level (trained or competitive athletes); and (iv) diet co-intervention (with or without extra supplementation) as distinguishing characteristics. If you scrutinize the overview in Table 1 you will recognize that neither the initially cited study by Wilson et al. nor its follow-ups made the cut. I have to admit that I am not sure why this is the case. Maybe it's as simple as the lack of information about the subjects' training experience in years. Since they are described as "resistance trained" and had an average squat, bench press, and deadlift of 1.7 ± 0.04, 1.3 ± 0.04, and 2.0 ± 0.05 times their body weight, respectively, it is yet almost impossible that they didn't train for at least one year. Maybe I have overlooked an important exclusion criterion, but of those listed in the flow diagram in Figure 1, none seem to apply to Wilson 2014. It may thus have been the ongoing criticism and scrutiny from the scientific community (Phillips 2017) that turned the balance against the inclusion of Wilson's HMB research. What do previous meta-analyses say? As the authors point out, to-date, three meta-analyses have been carried out in different populations. The first one, by Nissen and Sharp (2002), concludes that HMB is an effective supplement for gaining fat-free mass and strength when taken in conjunction with resistance training in both trained and untrained healthy adults. 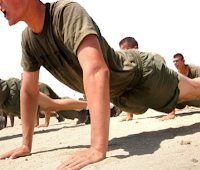 The second one by Rowlands and Thomson (2009) reports only trivial gains in trained men and a small effect in untrained men. And, in the third one, Wu et al. (2015) conclude that HMB supplementation, when added to a resistance-training program, prevented fat-free mass losses in older adults. 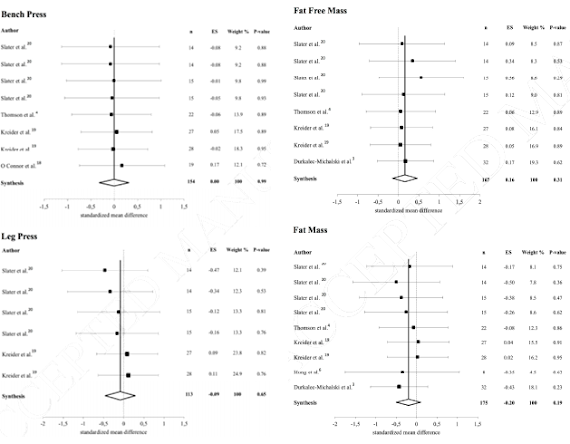 Be that as it may, for the remaining 6 studies in the meta-analysis, the results (see Figure 2) clearly support the initially quoted conclusion that there's no physiologically relevant "effect of HMB supplementation on strength and body composition in trained and competitive athletes" (Sanchez-Martinez 2017). 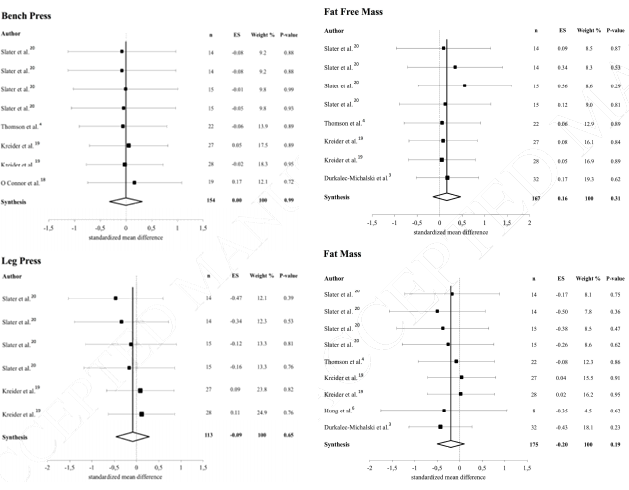 Figure 2: Effects meta-analysis of HMB on strength (left) and body composition (right). Abbreviation: ES = effect size; n = number of subjects. p-value <0.05 was used for significant findings (Sanchez-Martinez 2017). HMB did not generate any appreciable effect on bench press strength (ES = 0.00; 95% CI −0.32 to 0.32; p= 0.99), or leg press strength (ES = −0.09; 95% CI −0.46 to 0.28; p= 0.65). 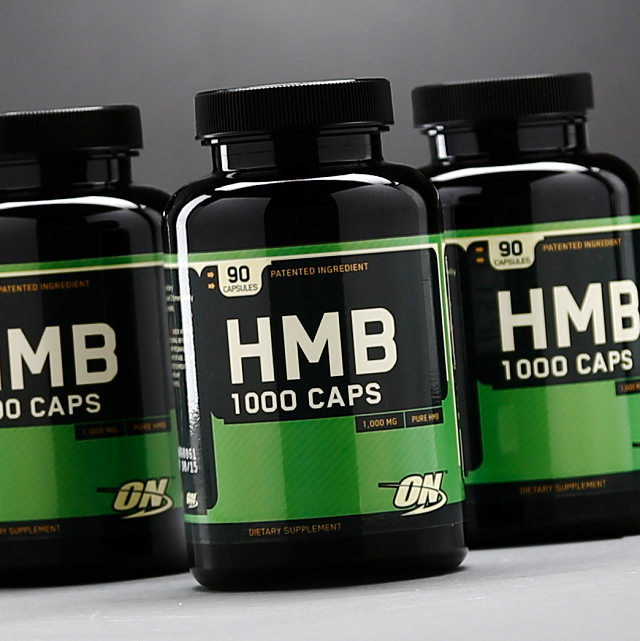 there were no statistically significant effects of HMB supplementation on body composition, i.e. body mass (no effect), fat-free mass (trivial positive; ES = 0.16) or fat mass (small negative; ES = -0.2 effect = small fat loss). Neither the changes in body composition nor the previously mentioned NULL-effect on bench press and leg press strength had a statistically relevant heterogeneity. The scientists still conducted a subgroup analysis which did - and that's not really surprising, then - "not present any significant effect when carried out for the subgroups (HMB doses, duration of intervention, training level, and diet co-intervention) and exclusion sensitivity analysis (p>0.05)" (Sanchez-Martinez 2017). Bottom line: When only studies in previously trained individuals and competitive athletes, i.e. those with the greatest interest in spending money on HMB-supplements are tested and the contested HMB research by Wilson et al. is excluded, "HMB supplementation [does] not generate any significant effect on strength (bench and leg press) nor body composition (body mass, fat-free mass, and fat mass)" (Sanchez-Martinez 2017). In their discussion of the differential effects on body fat, the authors do yet rightly point out that the discrepancies, e.g. one study in judo athletes showing sign. reductions in body fat mass while no change was observed in a sample of collegiate football players, could be a result of the "interaction between supplementation and sport specific training (i.e., volume, intensity, duration, sports discipline etc.) - this, in turn, gets us back to the Wilson-study/-ies, in which both, training volume and intensity were significantly higher than in most previous HMB studies. Speaking of "HMB studies", even if it may not answer the question if HMB is useful for athletes 'once and for all' (no study or meta-analysis will do this, btw), the fact that Sanchez-Martinez et al. found only 6 studies that qualified for their meta-analysis clearly indicate that more research is necessary - also to answer the often-heard question whether the free acid form of HMB is in fact superior to it's slower-digesting calcium-equivalent (note: in this meta-analysis the studies using slow-release HMB showed better results than those with the fast(er) digesting regular Ca-HMB; since it's absorption speed is supposedly the reason for the superior effects of HMB, it is unlikely that the null effect that was detected in the meta-analysis at hand was a result of the studies' use of the allegedly inferior Ca-HMB). In that, Sanchez-Martinez et al. speculate that the reason why trained individuals appear to benefit even less than untrained or elderly subjects is that "athletes generally follow a regular optimized training (balance between training load and recovery), allowing them to significantly reduce muscle protein breakdown" - which is, as you as a SuppVersity reader know, where HMB appears to excel (learn more) ... be that as it may: Overall, the contemporary evidence (minus the 'Wilson-paper') suggests that there may be "possible benefits of HMB in untrained, but not in trained and competitive athletes" (Sanchez-Martines 2017) | Comment! Liberati, Alessandro, et al. "The PRISMA statement for reporting systematic reviews and meta-analyses of studies that evaluate health care interventions: explanation and elaboration." 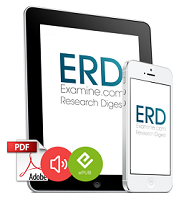 PLoS medicine 6.7 (2009): e1000100. Nissen, Steven L., and Rick L. Sharp. "Effect of dietary supplements on lean mass and strength gains with resistance exercise: a meta-analysis." Journal of Applied Physiology 94.2 (2003): 651-659. Phillips, Stuart M., et al. "Changes in Body Composition and Performance With Supplemental HMB‐FA+ ATP." The Journal of Strength & Conditioning Research 31.5 (2017): e71-e72. Rowlands, David S., and Jasmine S. Thomson. "Effects of β-hydroxy-β-methylbutyrate supplementation during resistance training on strength, body composition, and muscle damage in trained and untrained young men: A meta-analysis." The Journal of Strength & Conditioning Research 23.3 (2009): 836-846. Sanchez-Martinez J., et al. "Effects of beta-hydroxybeta-methylbutyrate supplementation on strength and body composition in trained and competitive athletes: A meta-analysis of randomized controlled trials." Journal of Science and Medicine in Sport (2017): accepted manuscript. doi: 10.1016/j.jsams.2017.11.003. Wu, H., Xia, Y., Jiang, J., Du, H., Guo, X., Liu, X., ... & Niu, K. (2015). Effect of beta-hydroxy-beta-methylbutyrate supplementation on muscle loss in older adults: a systematic review and meta-analysis. Archives of gerontology and geriatrics, 61(2), 168-175.